It’s been a week since the previous dev status update, and, as we promised last time, we would like to keep our community posted weekly, so here is another update on GRAFT development status. Last week we continued working on RTA implementation in several directions including fixing bugs discovered during alpha testing, implementing the full automated test suite, preparing a new supernode release, and continuing working on stability of the communication protocol. The fixes include the bugs in initial seed connection, p2p logging, and storing of p2p state data. The automated test suite is built on python-based test framework and will allow to automate the regression and other QA tests. The new supernode release for alpha testers will be available later this week. In addition, we are finalizing the supernode plugin framework which will be used for plugging extra apps such as exchange brokers into the supernode. Speaking of exchange brokers and other components of GRAFT network ecosystem, we almost finished developing a live demo that showcases the payment flow on a hardware payment terminal. One of the main goals of GRAFT project is bringing crypto payments into the physical world of brick-and-mortar stores. Unlike most other projects in the area of crypto payments, we realize that the shortest way to adoption by brick-and-mortar retailers and service providers is using their existing hardware payment terminals (aka “pinpads”), because these terminals are already integrated with various point of sale systems. While there are only a few major payment terminal brands, there are hundreds if not thousands of types of point of sale applications they are connected to. Hardware payment terminals can be loaded with additional software such as GRAFT payment app, without requiring retailers to purchase, test, certify, and maintain a new hardware in their stores. But how to showcase such an app online if it’s designed to run on particular hardware? 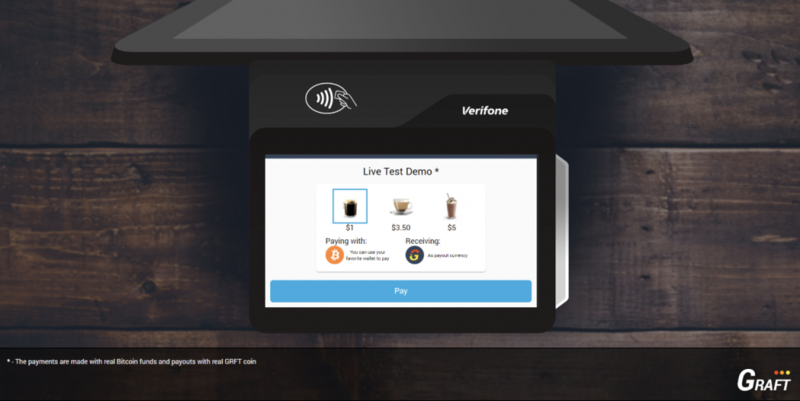 Our payment application emulator is the first version of such a showcase application that will allow the demonstration of altcoin acceptance on a Verifone terminal using GRAFT network. The initial version of the emulator (see the screenshot below) will be released later this week and available for anyone to try a Bitcoin/GRAFT payment. From the last week’s events, it’s also important to mention the following two things. First, the incentives for RTA supernodes. Although this is not directly related to development process, the additional rewards will help boost the RTA network once it’s released to public beta on the mainnet. Second, the patch fixing the code execution vulnerability which was “silently” released last Monday. The fix for this denial of service vulnerability is merged into master under 1.4.5 and can be downloaded and built by anyone running GRAFT network nodes (please do not confuse it with the previous “burning bug” patch 1.4.4 for exchanges that was released a few days before the last one). See you next week! Happy GRAFTing!